We’ve been waiting for this one for quite a while! From the director that brought us “Pulp Fiction” (1994), “Reservoir Dogs” (1992), “Natural Born Killers” (1994), “True Romance” (1993), “Django Unchained” 2012, “Kill Bill” (2003, 2004), “Inglorious Bastards” (2009), Mr Quinten Tarantino is making a new movie which will hit cinemas Thursday, August 15th. “ONCE UPON A TIME IN… HOLLYWOOD” stars big names, as you would expect, such as Luke Perry, Margot Robbie, Leonardo DiCaprio, Brad Pitt, Dakota Fanning, Al Pacino. 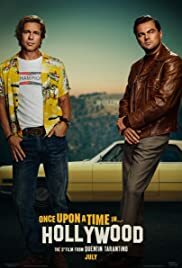 Director: Quentin TarantinoWriters: Quentin TarantinoStars: Luke Perry, Margot Robbie, Leonardo DiCaprioSummary: A faded television actor and his stunt double strive to achieve fame and success in the film industry during the final years of Hollywood's Golden Age in 1969 Los Angeles.